The order for this cake was placed from the UK, and Brian was absolutely delighted with his 21st birthday cake which came as a wonderful surprise from his sister who ordered it for him from me. 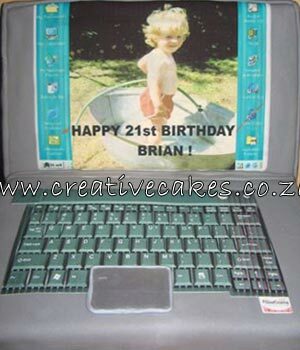 It was great fun creating a laptop incorporating an adorable screensaver of a much younger Brian. He was chuffed with the detail and the whole idea. It was a roaring success!